In the past couple of years, I’ve made my first attempts at yeasted breads and they’ve all turned out pretty well. It’s been mostly pizza dough with the occasional sweets such as cinnamon rolls and king cake. This summer, I started to think about bread more. The “problem” with bread is that not only is it pretty cheap to buy (even good bread), but making it also requires planning. The combination of these two issues has definitely been a challenge for me, but I’m working through it. And of course, there’s the other issue of just not having much of a clue, but luckily, there are books and the web. 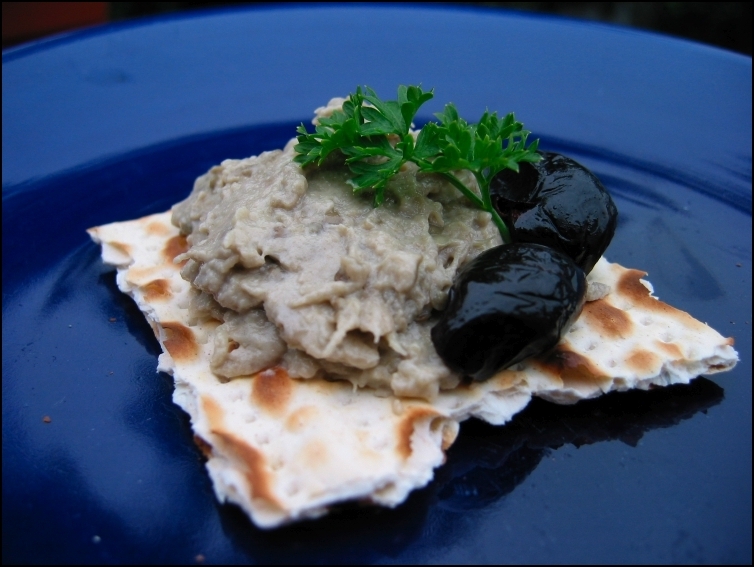 This recipe is from Ultimate Bread by Treuille & Ferrigno. I’ve found this book useful both for its breadth of recipes as well as detailed instructions concerning all the steps of the process. It was also already in the house, and thus won on convenience. I’d still like a copy of The Bread Baker’s Apprentice (and Crust & Crumb) but this will have to do until there is more discretionary income. Pide is a Turkish seeded bread. I did not have the seeds the recipe called for (nigella), so I used white sesame seeds on one and zaatar on other. This is a delicious, simple, and versatile bread, which worked great not only for eating alone, but also in strips alongside soup or dip or spread with Spiked avocado or even split the long way as a base for toaster oven pizza using assorted leftovers. It was just like French bread pizza. These corn muffins represent the first recipe ever I tried from the good folks at The Post Punk Kitchen. Isa’s recipe is fabulous, though too sweet for my tastes so I cut down the sugar and make other minor mods like adding whole kernel corn. I like the added texture of the corn and also use it as a garnish. These are always a big hit at potluck events, so for a hot foods party, I made a spicy version with the addition of chipotle chilis in adobo sauce. Then I made a batch of each for a tasting party. The chipotle provides a nice smoky hotness that doesn’t sting, but really builds with each bite. 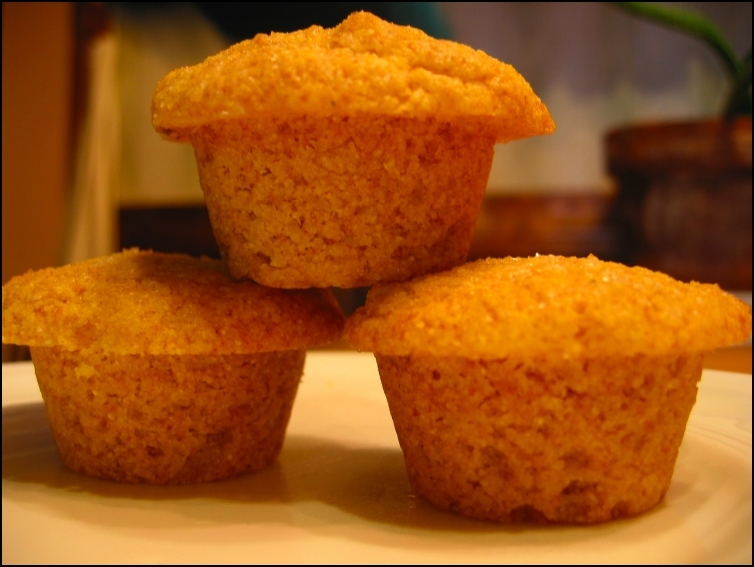 Mini-muffins, which are wonderful in any context, are especially nice for a potluck when a full-sized muffin might be more than one person wants to eat. But everyone can eat a mini! 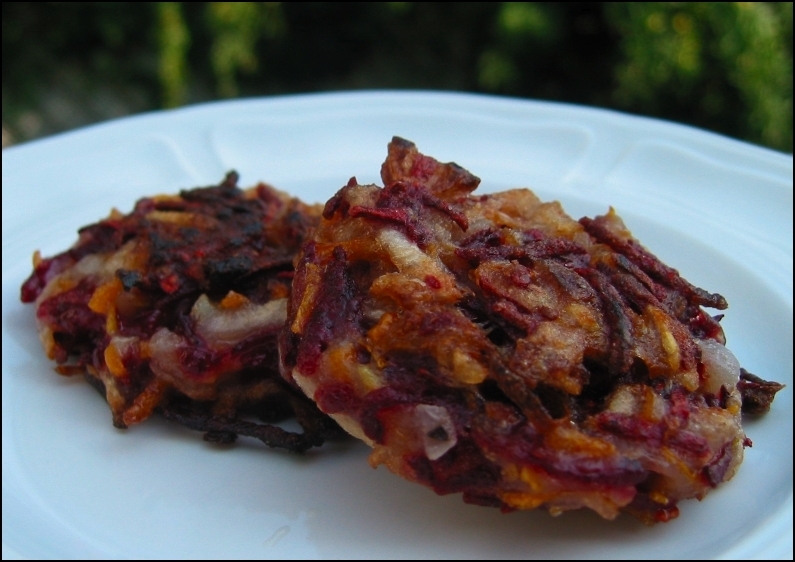 Some years back, DD’s mother passed along a recipe for Passover “rootkes”, aka latkes but with assorted root vegetables other than potato (more recently, I ran across a similar recipe on PPK). 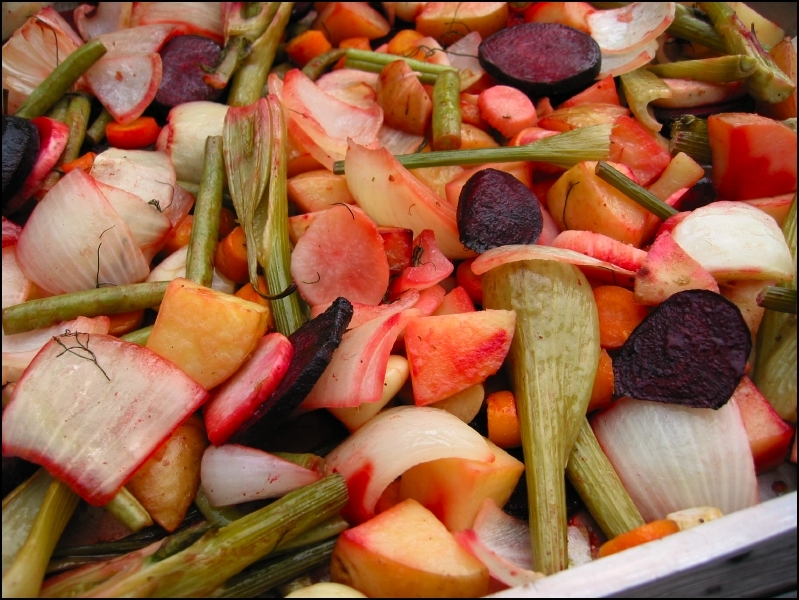 Since I’d already shredded a boatload of farm share beets, rootkes seemed the obvious choice, especially since I also had the share potatoes, carrots, and onions. The original recipe called for sweet potato, but I found it worked quite well with the regular kind, too. I used flour instead of matzah meal (and cornstarch instead of potato starch) because, well, it’s not Pesach, and it was just easier this way. I also tested two cooking methods: frying and baking. Fried was somewhat tastier (no surprise there), but baking was also quite yummy and had the advantages of using less oil and not needing to tend to a pan in front of a hot stove in the summer. These were so full of yummy that I’m ashamed to admit how many I ate in the name of testing. Last weekend, my friend John gave me some peaches out of the bushel or so he’d picked from a friend’s trees. The were quite delicious, but too many to eat before they turned (especially with more peaches coming in my farm share). 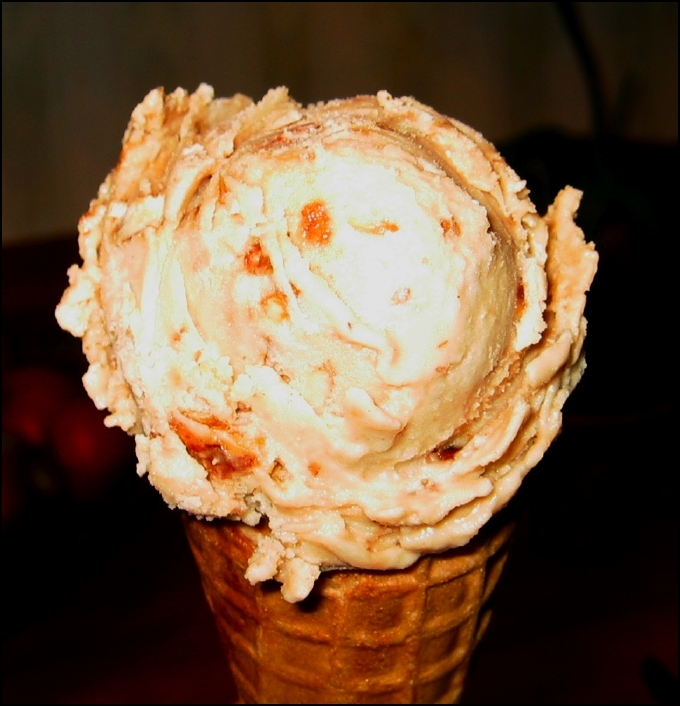 Being a traditional Southern gal, my thoughts immediately went to peach cobbler. Okay, that’s a lie, but I do sometimes out a jaunty twang in my voice. I’d made a delicious (backyard) blackberry cobbler a couple of weeks prior with a recipe I found online, so I modified it a bit for the peaches. It turned out delicious. I’ve made many many pies in my time, but I’ve also become quite a fan of cobblers (and crisps) for their fruity yumminess with much less effort. Watching the batter rise up through the fruit is a lot of fun, too. 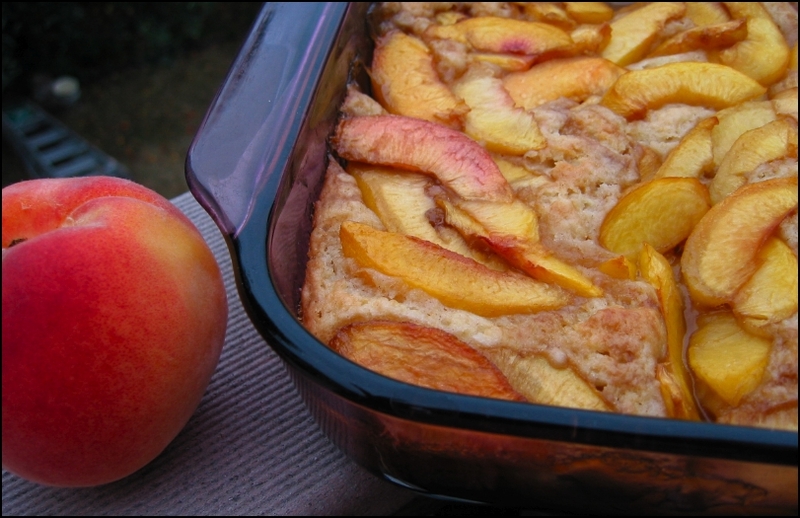 The result is a very light cake-like concoction spread through with peachy yumminess. This is one of my staple dishes. It’s easy to make and works with any number of veggies, so it’s great for using up whatever might be around in a simple, healthy way. The only things I pretty much *always* include are onions and garlic. It’s gone over very well at potlucks and barbecues, too. I’m almost embarrassed to admit how easy it is given how well it’s been received. Seasoning can always be adjusted as desired, but Spike is always a good bet. For a few weeks, I was receiving tons of beets with my farm share. 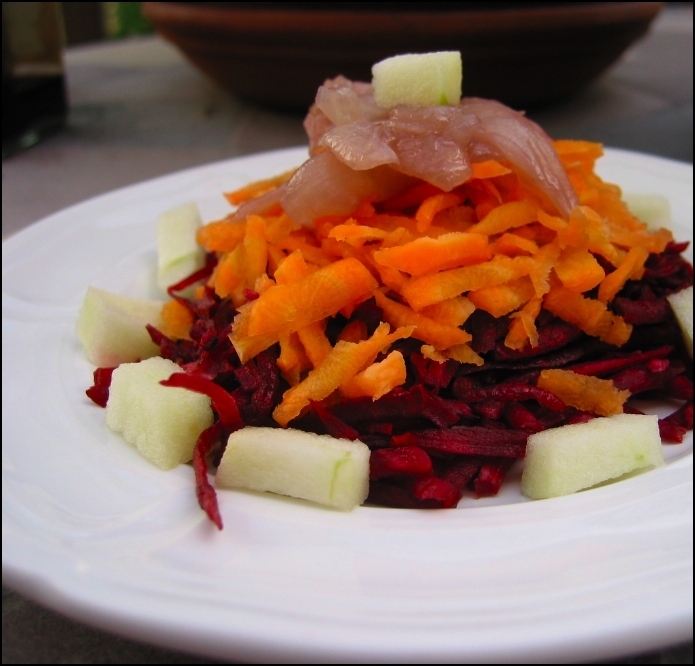 One day I decided to shred a dozen or so, which sent me from wondering what to do with beets to wondering what to do with shredded beets. Inspiration came from pondering other available produce, which included farm share spring onions and carrots as well as a couple of apples. I love the shredding disc on my food processor. And I love caramelized onions. The whole thing came together beautifully with a splash of balsamic vinegar. My friend Jay was over rah-rah-ing the whole way, which also helped. We ate the lovely and yummy salad sitting out on the porch. The balance of the various sweet, sour, and tart flavors worked out just right. 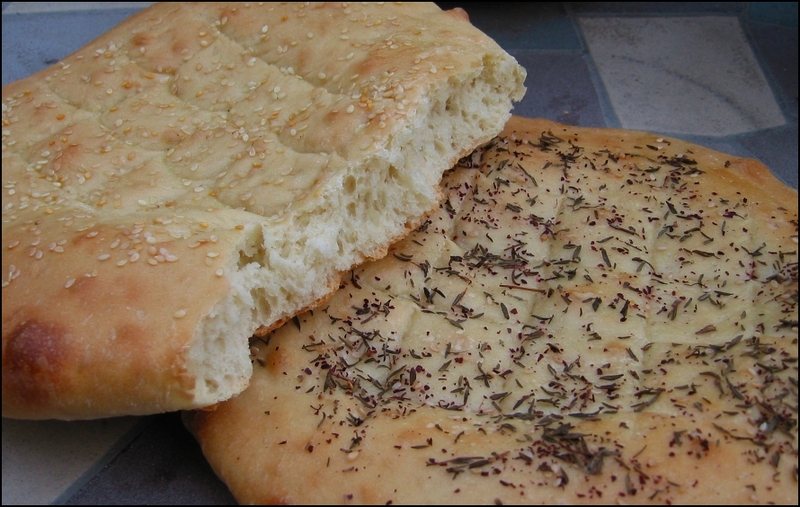 On a beautiful summer day, I wanted some freshly baked bread so decided it was time to take my first shot at focaccia. I searched many recipes and ended up combining aspects of several of them. The result was not quite the texture I was aiming for, but it was still light, flavorful, and delicious. 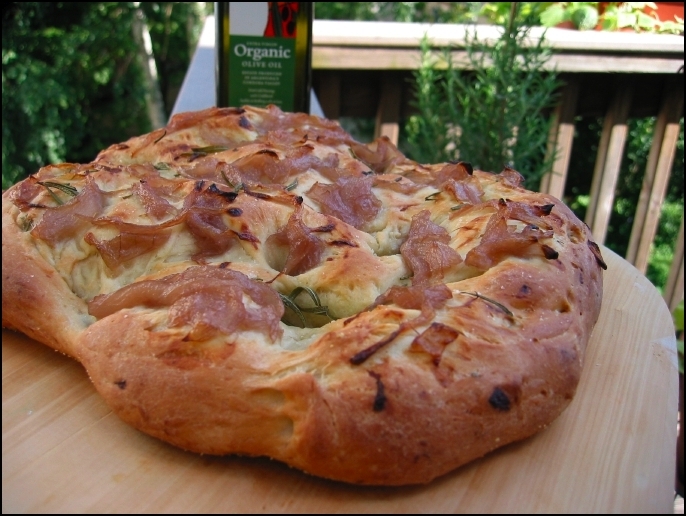 I incorporated rosemary from my home garden (the top of the plant is visible to the right of the olive oil) in the dough as well as on top and also topped it with onions made from my farm share caramelized with some maple syrup and red wine. My favorite thing to do with tomatoes is make bruschetta. I got addicted to the stuff at my favorite Italian place (Salvi Restaurant, Brooklyn, NY), where they serve it on crostini at the start of the meal along with grissini and warm bread. It was the first food I could really enjoy that had discernible tomatoes that weren’t cooked to the point of being sauce. Since then, I’ve taken big steps such as adding tomato slices to sandwiches. Last year I was able to start eating cherry tomatoes whole! But when using the standard sorts of tomato, I still make sure to remove the seed goop (aka “tomato snot”). This particular batch, which I made with DD, used a mix of tomatoes from my farm share (red) and my garden (yellow) as well as basil from the garden. 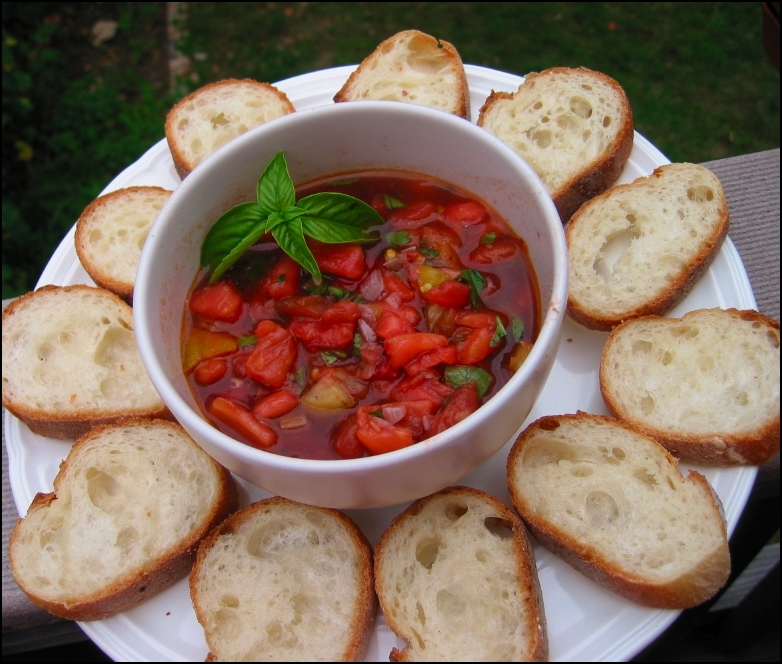 I have never measured anything for this dish, in part because a lot depends on the tomatoes. Go with what feels right.